Tip: Get on an easy slab climb and practice making the ascent with your legs, only using your hands for balance and not for helping your upward movement. 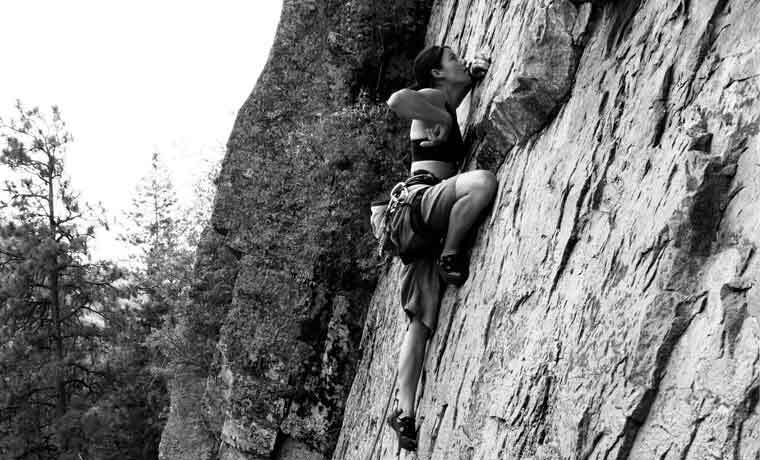 Traversing (climbing sideways instead of upwards) is a useful style of climbing to help you practice this. Most indoor gyms will have a traverse wall which not only helps you get your climbing muscles warmed up, but is also really useful to make you think about your foot placement. As you become more confident, start to further limit yourself on where you put your feet. You’ll be amazed at how little your feet need to stand on to give support for the legs to push off and you’ll begin to realize that the seemingly bad footholds are actually just good enough. The main reasons for its use are to put the body close to the wall and into a straight arm position. This will conserve precious energy and also put seemingly far off holds into reach. It may seem counter-intuitive to start with and it’s not something that will suit every type of climb. But with some practice and experimentation your climbing will become more fluid with less effort and your upper body will thank you for it! It’s all about balance. Improving your balance goes hand in hand with making lasting improvements in your climbing. 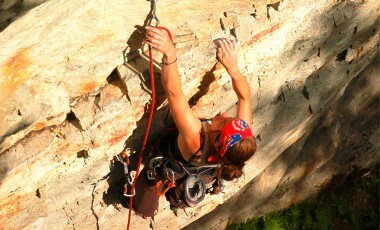 Practice traversing using solid footholds and putting as little weight as possible on your hands. Many climbers also play around on slacklines to help with their balance. It is only when we are pushed onto something a little different that we realize that we’ve pigeon-holed ourselves into only being good at one thing. If you’ve just started climbing and envisage it featuring in your life, then spending some time getting the right shoes is well worth it. It doesn’t matter that you are only a rookie – the precision and quality of high-end shoes will enable you to use all parts of your foot and you will gain significant benefits from this right from the word go.